Jessie Moore loves school She arrives at school ready and willing to learn. She greets all those around her with smile on her face and a positive attitude. When there is a student that needs help, Jessie is quick to lend a helping hand whether its finding a lost item or helping a student pick up something he has dropped. 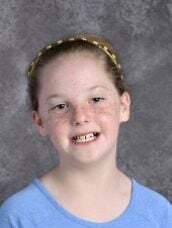 Moore attends Hettie Halstead Elementary and is in the fourth grade. She’s been nominated for the Central Texas Incredible Kid Award bestowed by the Central Texas Youth Coalition. Winners selected for the honor will be recognized at a luncheon at the Bell County Expo Center on April 17. Teacher Karen Patterson nominated Moore for the award. She said Moore leads by example. “Jessie defended a student that was being bullied and reminded the other student how important it is to spread kindness with a smile or gesture,” Patterson said. Moore asked Patterson if Moore could be the classroom buddy for new students when they arrive at Halstead Elementary. Moore demonstrates these acts of kindness without prompting from the teacher. In the classroom, Moore is quick to partner with a student that requires assistance with his assignments. Moore especially enjoys reading to the younger students in the lower grades and helping them with learning their letters and numbers.